Sunset Reports provides so many features and one of them is being able to write your own programs in VB.net, Jscript .net, or C#. Yes that means that you do not need Microsoft Visual Studio to learn programming. You can write a .net program as a script for a report and have an empty report if you only want to run the code. To execute the code you simply run the empty report. Previewing the report will execute the code as well or you can schedule the report to run in the queue. So you can write program and then schedule it’s execution. Or with the opening arguments capability in Sunset Reports, you can launch a report (your code) directly from a shortcut on your desktop. What a great way to learn to program with minimal cost. And don’t forget you can validate your code while you design it to find errors in syntax. And in addition to that your code can be part of creating a document/report, or be the logic behind an interactive report/form in Window View. 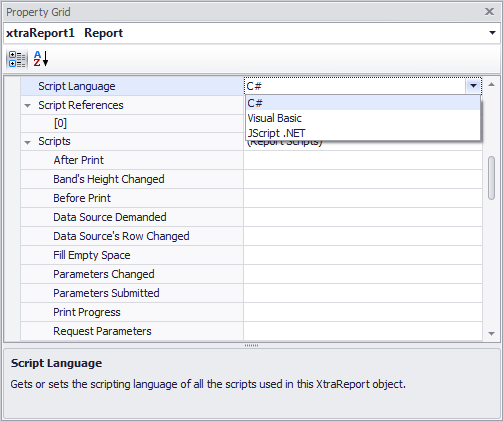 You can choose which language you want to use when you create scripts for your reports. C#, Visual Basic, and JScript.net are all available choices. Choose the language from the report properties window.